Giselle Shardlow is the author of Kids Yoga Stories. Her yoga-inspired children’s books get children moving, learning and having fun. She lives in San Francisco with her husband and daughter. 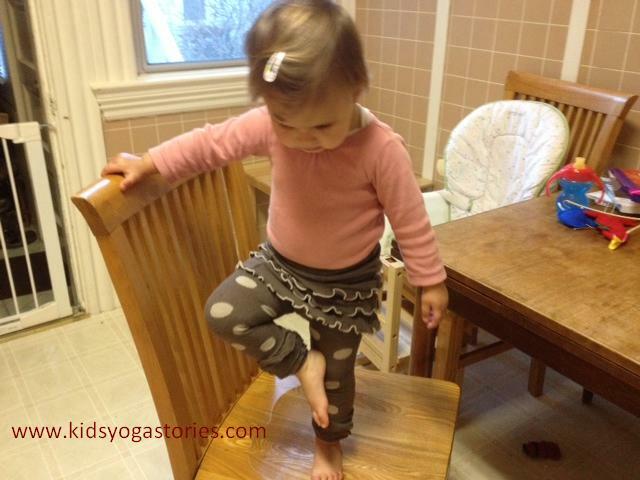 Find her books at www.kidsyogastories.com or on Amazon worldwide. “¡Agua, Agua, Agua!” Your Toddler Speaking Spanish. “Agua, agua, agua,” our daughter says in excitement as she learns to talk. I love Spanish – the romantic language of the community-oriented culture of the picturesque, vibrant and welcoming Latin American countries. So after I gave birth to our daughter last year, my husband and I wanted her to learn Spanish. However, our first language is English. I learned “conversational” Spanish while living in Guatemala as a primary school teacher, but not enough to feel confident to teach it to our daughter. The three of us are working together to learn Spanish as a family. Today, I would like to share a few ideas for English-speaking parents to create a home environment where their children can learn Spanish for life. Start early. Studies show that children learn languages best when they are under one year old. It’s never too early to start learning Spanish, and it’s never too late to start, either! Be light and playful. Creating a healthy learning environment is important. Keep it simple. Integrate Spanish into your everyday life and allow them to experience Spanish in a fun, lighthearted way. Be passionate and excited. Studies point to children feeling comfortable and relaxed as an important part of learning at their best. Enjoy yourselves as you learn Spanish. Link the Spanish words to their real life. Appeal to their different senses. For example, on your next trip to the zoo, talk about the Spanish names of the animals. Have a dedicated Spanish speaker. While training to become a teacher, I learned that the best way for a child to learn a second (or third) language is for each person to speak only in that chosen language. Because I chose to speak my first language of English to our daughter, we decided to hire a Spanish-speaking nanny for one day a week. I also get to practice my Spanish so it’s win-win. If you have a Spanish-speaking friend or relative, that’s even better. Offer a variety of books and resources. Have different media around your house in Spanish. For example, check out board books and picture books from the library, find Spanish stickers, or play with Spanish picture cards. It’s important for them to see the language in different formats and in different mediums throughout their environment. Spanish Playground reviewed my yoga-inspired Spanish book as a way to teach Spanish through movement and story. Play audios or videos. Bring out your Spanish songs, music CDs, and child-friendly videos. We love Umbral Yoga’s Spanish Kids Yoga video. Our daughter is enthralled with the children practicing yoga and follows them by standing in tree pose while “counting” to ten in Spanish. The video is another great way to experience movement and learn together. Reinforce key words. Our daughter’s first Spanish word was “agua.” But of course, it comes out as “agua, agua, agua!” We praise her new Spanish words and model repetition to reinforce her learning. We also count to ten in Spanish every time we walk up the front steps. Reinforce the keywords that interest your child. Join Spanish playgroups. Look in your area for Spanish-speaking playgroups or story times. In San Francisco, there are toddler classes by Toddlers Discovering Latin America and our library offers Spanish story time. These are great ways to meet other like-minded bilingual parents or native Spanish speakers. Travel to a Spanish-speaking place. We are lucky to live near a Spanish-speaking neighborhood, so our daughter can hear Spanish in everyday life. Also, when you are considering a holiday destination, consider visiting a Spanish-speaking country with your family. The idea is for your children to hear Spanish in different contexts and situations, so it becomes part of their lives, not merely an isolated Spanish class. No need to reinvent the wheel. As Spanish Playground has shown us, lots of resources out there support us in teaching our children Spanish. Connect with other parents who are teaching their children Spanish as well and share ideas. You don’t have to do it alone. Reach out and ask for help. We hope to raise our child to be a responsible global citizen who speaks at least two languages. I have loved being able to speak Spanish to people around the world throughout our travels. Learning Spanish has been extremely rewarding. Is there at least one tip above that you can implement with your child right away? I would LOVE to hear from you if you have any other ideas for teaching Spanish to your toddler, or if you have any questions, please email me at giselle at kidsyogastories dot com. Get free kids yoga resources in your inbox by signing up for Giselle’s weekly Kids Yoga Stories newsletter or check her out on Facebook, Twitter and Pinterest.